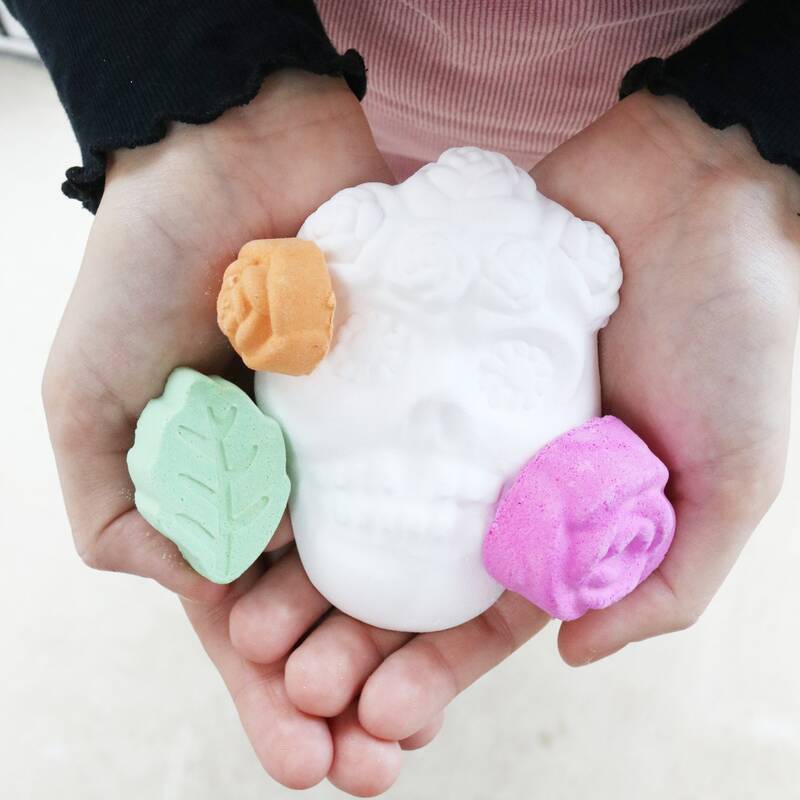 A skull and roses bath bomb tribute to the Mexican holiday ‘Day of the Dead’ (Dia de los Muertos). Kind to sensitive skin. 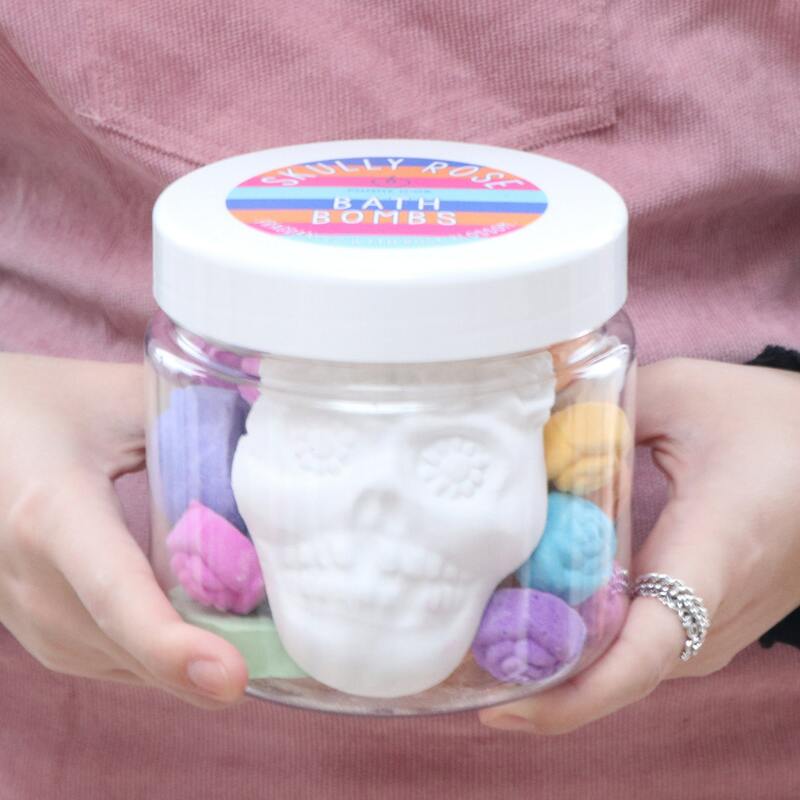 Each jar contains one white skull bath bomb embedded with little hidden bursts of bath bomb colour. 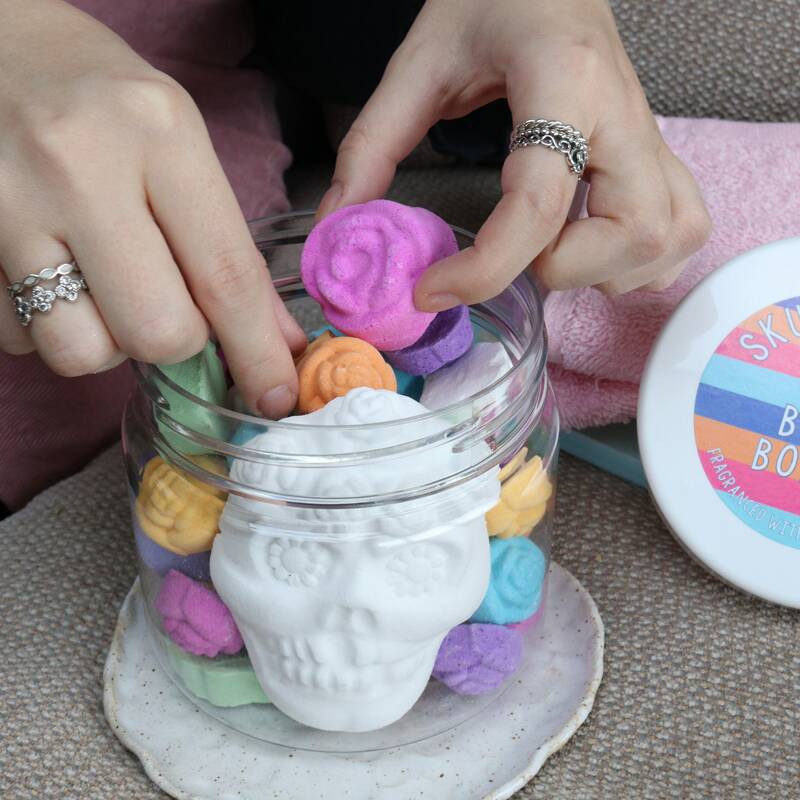 The skull is surrounded by colourful bath bomb roses and leaves. They're all scented with the fresh bold fragrance of Rock Blossom. Mandarin and cherry blossom sit on a solid stone heart of pink lotus and spicy pink pepper. Musk, amber and sandalwood round off this beautiful allergen-free scent. Why kind to sensitive skin? The ingredients are kept simple and the fragrance, to the very best of the fragrance manufacturers knowledge, does not contain any of the 26 potential allergens that must be legally declared as outlined in EU directives, therefore classing it as allergen-free. 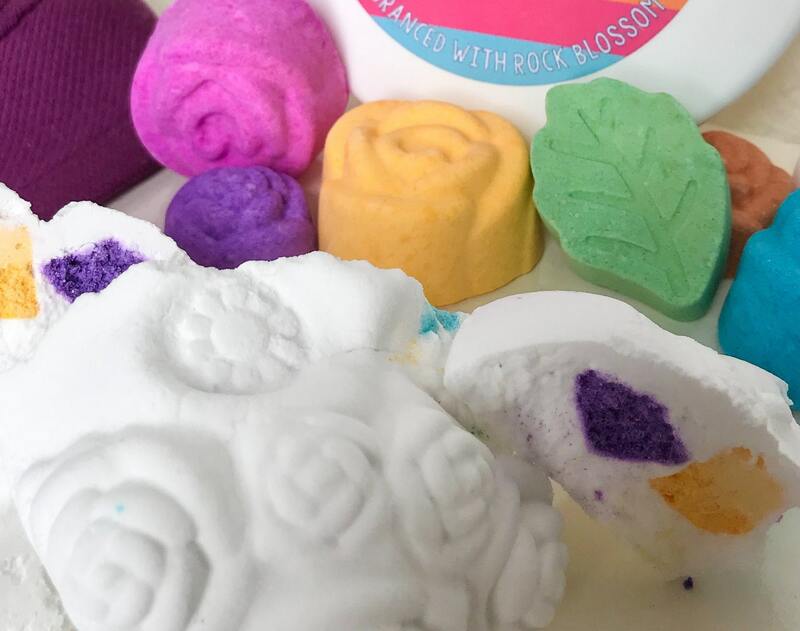 All bath bombs are made in small batches so that products are as fresh as possible when you buy them, giving them a 12-month shelf life. Colours may vary slightly from one batch to the next. They’re suitable for age 3+. This is a vegan product which has not been tested on animials. 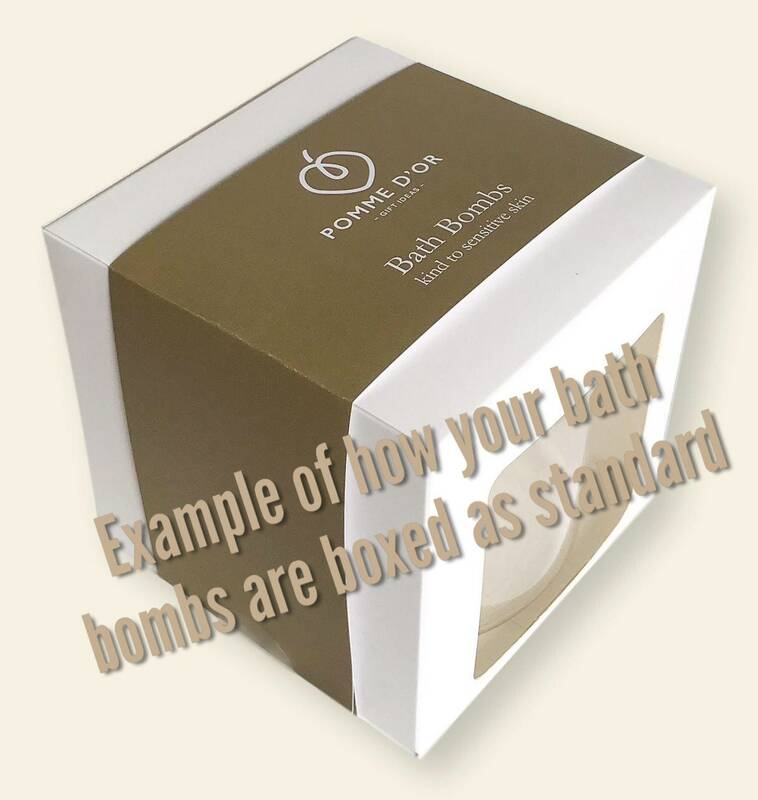 The white box comes as standard but we also offer a gift-wrapping service for a small extra charge; please see example photo. Why not send direct to recipient and include a personalised gift tag. Options can be selected at checkout. If you're looking for a bespoke order for party bags or favours, just drop me a note to discuss. I ordered from here last Christmas, and the gifts were so well received, so I came back this yet for more! This is going to be one of my go to shops every year I think!